Our D.J.s ‘spotlight’ the important moments in any live event. Creativity, sensitivity and class are key to your successful event. They provide a complete repertoire of music, MC the high-points of your event, and set the proper mood for each moment throughout the evening. Because our D.J.s are highly seasoned, at your request, they will engage and interact with your guests, always keeping the energy up and the crowd entertained. Venn is a charismatic D.J. and is good to go for all occasions, He is comfortable in all styles of music and is well-seasoned to the sensitivity of a client's needs. Whether a corporate event or wedding reception, he tailors his performance with fun and professionalism. 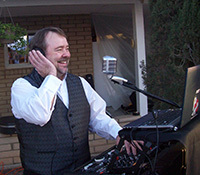 This entertainer is a witty, charming and effervescent DJ. 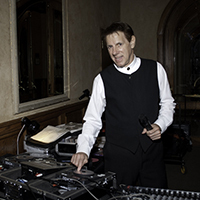 He uses the latest and most reliable technology in both sound and lighting, which combined with his knowledge of music covering several decades, ensures the success of your event. He does his job effortlessly and with high energy to entertain and interact with your guests. This DJ's upbeat personality and style is unique, all on its own. She has performed at prestigious theaters, television studios, hotels and private clubs where she has touched audiences from the California coast, Las Vegas, and the greater Phoenix Metro area. Being a professional actress, dancer and singer for the last 19 years, she is able to use her experience entertaining all over the world to create an interactive experience that guarantees the crowd has an amazing time at your event. This is a DJ who has a good feel for the right party atmosphere. 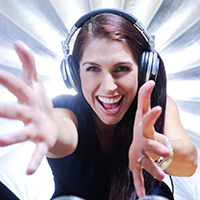 During her sets she’s focused on giving the people on the dance-floor a sensational party. The kind of music she plays depends on location, theme, and the guests. 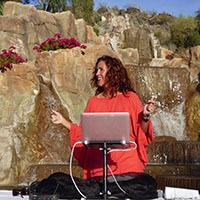 Since the transition from turntables to the top-of-the-line technology she is able to give her sets even more energy by using lots of acapella’s and effects. 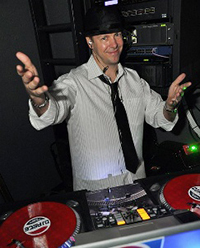 This is a DJ who is truly unique, in that he has an extensive Latin and Salsa repertoire, and plays the hottest and most crowd-pleasing contemporary music available today. 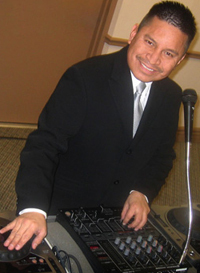 He brings the event to life with his own vibrant personality, This bi-lingual DJ energizes and excites any type of event.